Miko M. Wilford is an Assistant Professor of Psychology at the University of Massachusetts Lowell. She received a B.A. in Political Science and a B.S. in Psychology. In graduate school, she was awarded a National Science Foundation Graduate Research Fellowship while earning her Psychology Ph.D. from Iowa State University. She does not tweet, but she can be contacted online through her website at www.MikoWilford.com. Regular readers of this blog will know that retrieval practice (bringing information to mind) and interleaving (switching between ideas while studying) can be beneficial to learning. Many of our readers have also asked us about combining techniques. Some combinations, such as spaced retrieval practice, work really well. But what about interleaving retrieval practice with new learning? Could that work? In this blog post, Dr. Wilford tells us that having learners switch quickly between retrieval practice and new learning can actually be a bad idea. In 2013, a 7-study paper on retrieval practice made a big splash. In 5 of the 7 experiments, students first learned pairs of faces and names on the computer, and were then asked either to restudy each pair, or were asked to remember the name belonging to each face and type it into the program. But, here’s the twist: in between each face-name pair (or, the faces followed by the face-name pair, if they were practicing retrieval), students were also shown new information related to the face they had just seen. The same face would be presented, but now with a profession rather than a name. These researchers were interested in the impact of retrieval practice (i.e., trying to remember the name that went with the face) on students’ ability to learn new related information (i.e., the profession that went with each face). Those familiar with the literature (or those familiar with this blog) would expect (as the authors of this paper did) that retrieval practice would have a positive impact on learning in this context; in other words, when people retrieve information, they should retain that information better over time (the typical retrieval practice benefit), and in addition, they should be able to encode new related information more effectively. As expected, the typical retrieval practice effect appeared – students were better able to remember the names that went with the faces after practicing retrieval, rather than just restudying the names with the faces. Yet, not only was there no benefit of retrieval practice on the related new learning (the professions that went with each face), but retrieval practice of the originally-learned information (names) actually hurt learning of the new information (professions), compared to when students just restudied the original information. This surprising finding was replicated in all of their studies (even two that used different materials). Specifically, when students were asked to recall previously-learned information (names) before being presented with new related information (professions), they later remembered less of that new information, compared with students who had restudied the previously-learned information (names) prior to studying the new information (professions). When this paper was published online, one of my two PhD mentors, Dr. Jason C. K. Chan, assigned it as our weekly lab reading. At our meeting, he asked us all to come up with an explanation for these surprising results. Amid an interesting discussion, I developed a theory. My theory was that the method employed in this particular series of studies made it difficult for students in the retrieval practice condition to focus on new learning. Essentially, I proposed that the frequency with which students were asked to switch between retrieving originally-learned information (the face-name pairs) to learning new information (the face-profession pairs) made learning much more difficult. In contrast, students in the restudy conditions were simply asked to switch from restudying original information to studying new information, which was much less burdensome than switching from retrieval practice to study. I believed, therefore, that these unexpected results were a consequence of new learning being continuously introduced immediately after retrieval practice. Because I was approaching the end of my graduate career, I did not have the opportunity to follow-up on this particular theory with my co-adviser. Luckily, Dr. Chan and his current graduate student, Sara D. Davis, accepted the baton and designed a study to test my theoretical explanation of Finn and Roediger’s results after first validating their own theory—the borrowed-time hypothesis (2). In our study, students also studied face-name pairs first (original learning), followed by face-profession pairs (new learning). But the new twist we added to our study was how frequently students had to switch between retrieving (or restudying) original information, and seeing new information. In some cases, students did all of the retrieval practice (or restudying) in one go, then moved on to new learning. So, these students switched 0 times. 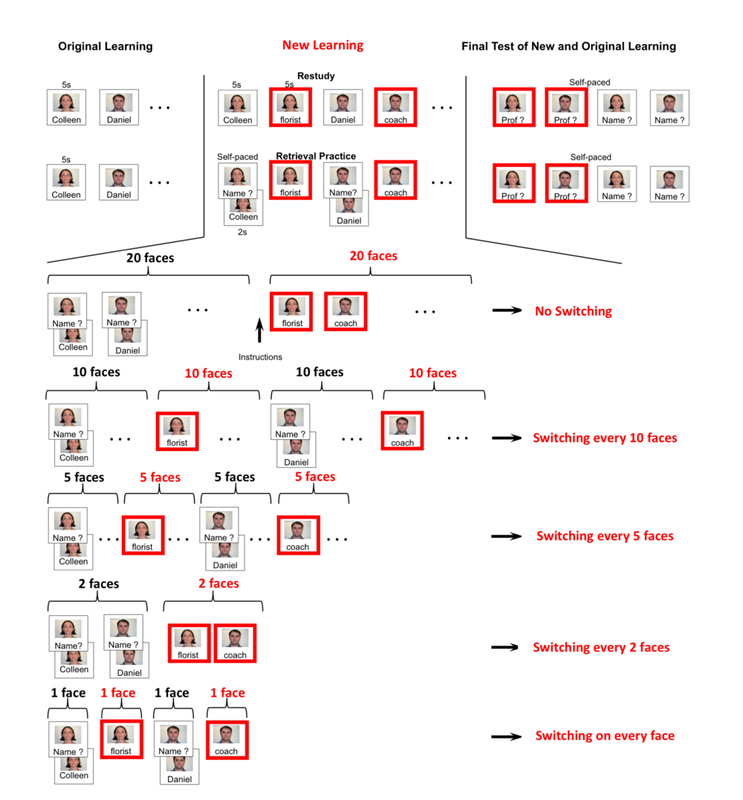 At the other extreme, some of the students had to switch between retrieval practice (or restudying) and new learning for every face (that’s 39 switches, because there were 40 faces; this condition was most similar to Finn & Roediger, 2013). And, between these two extremes, some students first practiced retrieval of names (or restudied the names) of 10, 5 or 2 faces, then studied those same 10, 5, or 2 faces with their professions, before switching back to retrieval practice of names for the next 10, 5 or 2 faces, and so on. By increasing task-switch frequency in this progressive manner, we were able to better test my theory. 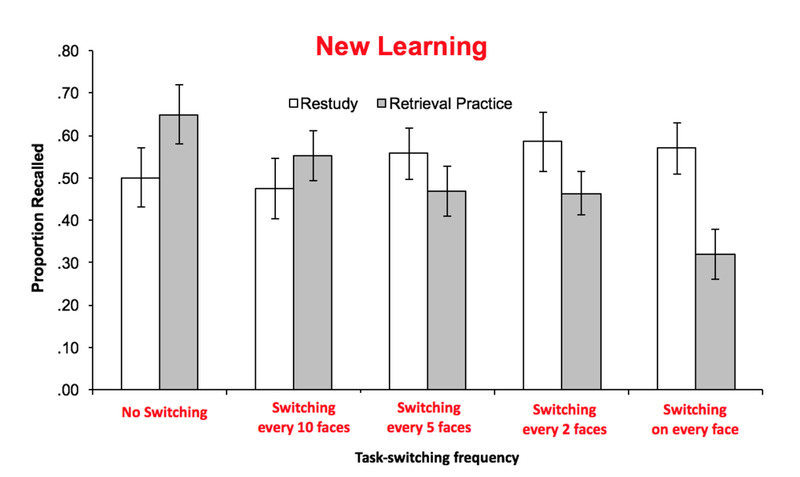 We predicted that as task-switch frequency between retrieval practice of original learning and studying new information increased, new learning would decrease. Here is a graphical breakdown of the procedure by condition (new learning is shown in red boxes). The results supported my original task-switching account. For those in the retrieval practice condition, new learning decreased as students had to switch more and more between retrieval practice and new learning. Importantly, we did not see this impact on new learning in the group that only restudied the original information! As you can see in this graph, when there is no switching between retrieval practice and studying new information (task switch frequency of 0), the retrieval practice of original learning actually helps students learn the new information. But when students had to switch constantly between practicing retrieval of original information and studying new information (task switch frequency of 39), exactly the opposite was found – retrieving original learning hurt new learning, compared to restudying the original learning! So, what does this mean for interleaving test questions with new learning? Given these results, should we still include retrieval practice questions in our lectures? To be clear, I am not in any way discouraging instructors from incorporating retrieval practice in their lectures. The benefits of retrieval practice still far outweigh the costs. Our research simply indicates that it is wise to include some review of previously-learned material immediately after a quiz or exam, and before introducing new material. This review will have to involved more than just providing students feedback on their retrieval practice as our participants did get feedback prior to the presentation of new learning. Only a more thorough review of previously-learned material will ensure that students are not constantly switching between retrieval of older material and learning new material.